Lauren O’Flaherty is a lifelong resident of East Bridgewater, MA. She attended UMass Amherst for Animal Sciences and has worked in the animal industry for over 15 years. 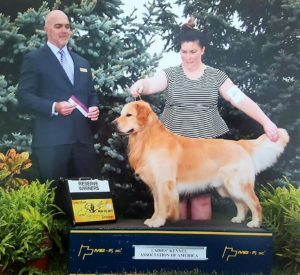 Lauren has worked for and trained her own dogs at Performance Plus for the better part of the last decade; most recently as their professional groomer. As a groomer, Lauren strives to ensure all dogs have a positive experience while in her care. She is constantly continuing her education in the grooming field to stay apprised of new technology, products, handling skills, and grooming techniques so that she can provide the best care possible to her canine clients. Lauren and her fiancé Matt have two boys, Ryan and Conor along with Golden Retrievers Cheers, Boom, Maverick, and Country. She is a breeder, owner, exhibitor of multipurpose Golden Retrievers under the prefix “Chipstone”. Lauren’s dogs have achieved various titles in multiple venues including the obedience, agility & breed rings. Click here to see groomings by Lauren.